Application: Service requests for the INFRAFRONTIER2020 mouse phenotyping service can be made via this application form. Applications for the Trans-national Access activity must include a short description of the project involving the mouse mutant being phenotyped by the INFRAFRONTIER2020 TA service. Acknowledgements: Please do acknowledge any support under this scheme in all resulting publications with "Part of this work has been funded by the European Union Research and Innovation programme Horizon 2020 (Grant Agreement Number 730879). MRC Harwell will provide Trans-national Access to researchers across Europe to submit mouse lines to their comprehensive phenotyping service. Four researchers will be able to use this Trans-national Access which builds upon the research performed in the EC-funded EUMODIC and INFRAFRONTIER-I3 projects. The centre is fully equipped with state of the art research instrumentation to facilitate comprehensive phenotypic analyses covering a wide range of physiological functions ranging from cardiovascular, neuro-behaviour and metabolism expertise to detailed pathology assessments. Routinely, all phenotyping activities are performed in a high-throughput fashion, as a service to support internal programs or for the wider scientific community. MRC Harwell is a partner in the International Mouse Phenotyping Consortium (IMPC) and currently performs first-line phenotyping of around 140 lines per year. This is funded by the UK MRC and the NIH. Phenotyping is performed according to the standardised SOPs within an agreed pipeline of tests. The tests and pipeline for the late-onset phenotyping is currently being agreed by the IMPC. The proposed ageing pipeline is shown below. The INFRAFRONTIER2020 project opens up new areas to users, in that phenotyping will be performed at later ages allowing exploration of late-onset disease. There are few laboratories equipped to offer this comprehensive phenotyping and access to it at later ages makes it a unique access. Users will benefit from access to the infrastructure and technical expertise of the MRC Harwell mouse clinic. In addition, they will be given support by MRC Harwell to analyse and interpret the results. MRC Harwell will also suggest additional phenotyping tests that they can do to further describe the phenotypes. 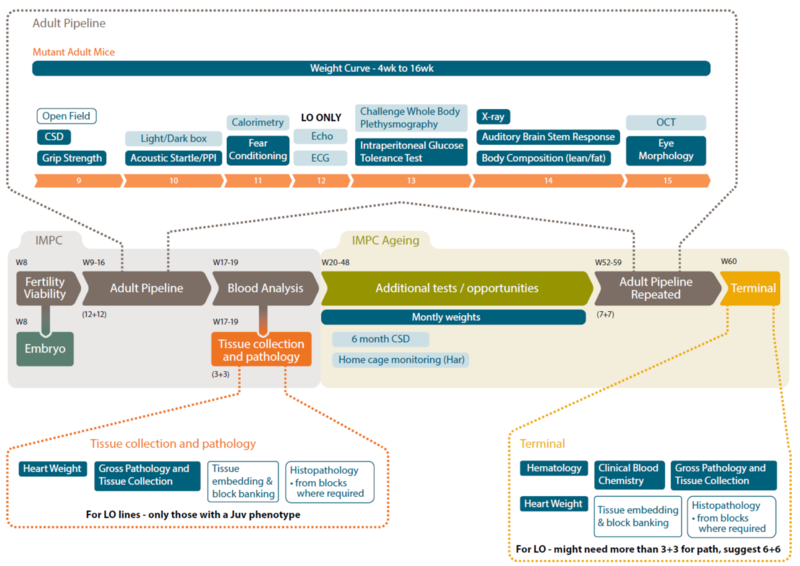 In general, the provided 1st line phenotyping pipeline will be based on the IMPC pipeline for adult mutant mice as described at http://www.mousephenotype.org/. The standard pipeline may be adjusted during the course of the INFRAFRONTIER2020 project.